On Sunday February 13th, Victory Brewing Company invited several beer bloggers from the PA/NJ area (I can only assume that our invitation got lost in the mail) to their Downingtown, PA brewpub for a preview of their latest beer, the Headwaters Pale Ale. Since the craft beer industry has exploded in recent years because of social media and word-of-mouth advertising, inviting a bunch of bloggers to try your latest beer and spread the word about it makes perfect sense (that’s how I learned about this beer). It’s also a hell of a lot cheaper than paying for a 30 second advertisement during the Super Bowl! Appearance: Golden Yellow. Thin, quickly dissipating head. Clear, rapidly rising bubbles. Little to no lacing. Aroma: Sweet oranges and grapefruit. Honey. Very fragrant hops. Taste: Medium carbonation. Very smooth texture. Slightly sweet, roasted malt flavor at first. Citrus flavor picks up in the middle. Slightly bitter hop finish. The deeper I go into the craft beer universe, the more impressed I become with the amount of variability that exists within each particular beer style. The Pale Ales that I have reviewed over the past few months have ranged from very malty (Smuttynose Shoals Pale Ale and Bell’s Pale Ale) to very hoppy (Dale’s Pale Ale and Great Lakes Burning River). 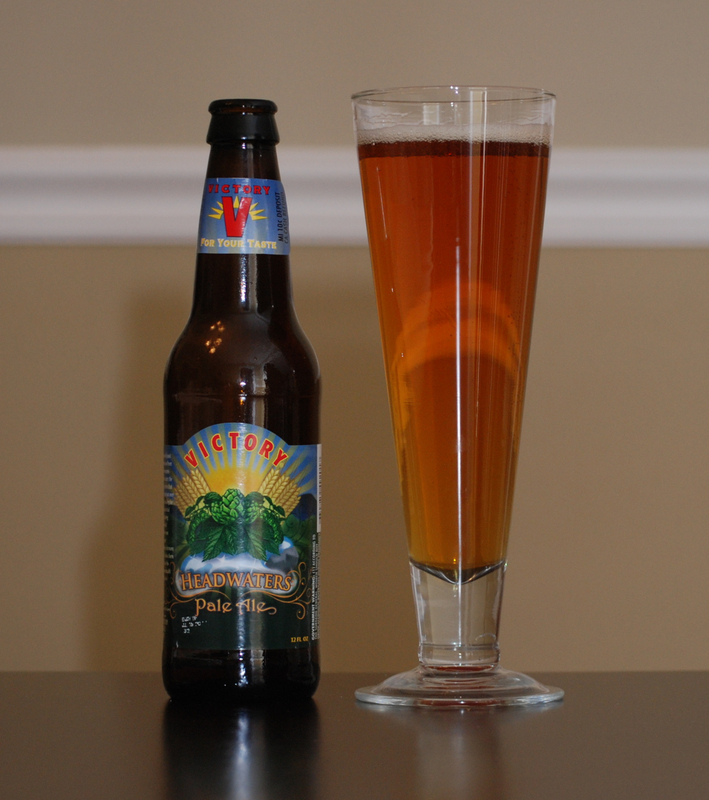 The Victory Headwaters Pale Ale lies somewhere in between, and reminds me of a hopped up pilsner. With its relatively low ABV and well balanced flavors, this is a very session worthy beer (it would also be a great way to introduce someone to the world of craft beer). Perfect on a warm summer day, and a fine accompaniment to a wide variety of foods (from burgers to BBQ to Thai and everywhere in between). Well done Victory! Great Beer Ads From A Great Brewer! Nice review. I really liked this stuff and agree that it’s going to be a great sessional treat this summer. Unfortunately for Victory, my current go-to session beers are their Lager and Prima Pils, so they are only stealing my bit ‘o market share from themselves. I wish you would’ve been there, G-LO. Next time I get wind of an event at Victory, I’ll definitely drop you a note. A road trip to Victory would be fun. Keep in mind… Philly Beer Week (PBW) is coming up quick, so keep us posted if you’re in the area. There were four of us making the rounds last summer. The more the merrier where PBW is concerned! Don’t look now but a relic of the beer blogisphere lurks! You have indeed snatched the pebble and danced the funky chicken across the rice paper with nary a tear. I haven’t tried Headwaters yet (as you know) but I’m pretty sure I’ll end up agreeing with your review. Then again, it is me after all and I may have to throw in a couple unexpected adjectives and surreal metaphors. I finally got around to sampling Victory’s ‘Smokin Oats on tap at the Pourhouse. With some luck and a little cooperation from my in-house editorial staff, I’ll post a review in short order. The Monger lives! How was that Arizona Cheese Symposium you just attended??? Room for snarky? NO …. That’s my pie! Room for weird? YES …. That’s the Monger’s schtick. Got a chance to sample this Brew at G-lo’s last night and I am not sure what to think. My first impression is that this is a beer trying to be two beers at once. The aroma was a mix of pine and ammonia. That heavy evergreen smell would lead one to believe that the taste would be all hops but its not. The taste is light with a hoppy aftertaste that sneaks up on you. So is this trying to be a smooth pale ale with a hint of hoppy bitterness or is a hop monster that got defanged? I may have gotten a bad bottle or the porter I had before this brew may have messed up tastebuds but the first impression was not great. I will give this one another try but for now the jury is out. I doubt very much that it was a bad bottle. It was released on the Feb 15th, and I bought them on the 20th. The oldest it could possibly be is 3 weeks. I think the porter f’ed up your palate. Tough to go from dark beer to lighter beer. I thought it was a very good beer. Not a great beer, but definitely a good one and worthy of a second try. Agreed …given Victory’s track record I think I need to retry when my palate is recharged. I blame the host at the tasting session for the lack of a sorbet or other suitable palate cleanser. You mean those crackers dusted with chicken bouillon weren’t good enough for you? That fact that you have chicken flavored crackers in your house calls into question every food review you have posted on this blog. I didn’t buy them, but I did eat them. Hate to see food, or “food” in the case of these crackers, go to waste. I just drank this at a Victory beer dinner in VA. I’m hit or miss with the brewery, but I really dug this beer and Old Horizontal. Thanks for the comment! It was a tasty beer. Sadly, I didn’t get to try it on draught this past weekend. Another time perhaps!